Oregon wildlife refuge occupation continues after arrest, death. Ammon Bundy, the leader of an anti-government militia, speaks to members of the media in front of the Malheur National Wildlife Refuge Headquarters on January 5, 2016 near Burns, Oregon. First I want to address my beloved friend Lavoy Finnicum. Lavoy is one of the greatest men and greatest patriots I have ever seen. His love for this country ran deep through the blood he gave yesterday. And I mourn for him and his family. I’m praying for you fervently in every prayer. We will have more to say later but right now I am asking the federal government to allow the people at the refuge to go home without being prosecuted. To those remaining at the refuge, I love you. Let us take this fight from here. Please stand down. Go home and hug your families. This fight is ours for now in the courts. Please go home. Being in the system, we are going to take this opportunity to answer the questions on Art. 1, Section 8, Cause 17 of the United States Constitution regarding rights of statehood and the limits on federal property ownership. Thank you and god bless America. Update, 6:35 p.m.: KATU reporter Lincoln Graves reports Ammon Bundy is asking fellow occupiers to end their occupation of the federal wildlife refuge they’ve been holed up in for more than three weeks. The FBI and state police staked out a spot along the route to John Day to stop the caravan. At first, both vehicles complied with an order to pull over, but then the lead vehicle took off, the law enforcement official said. It didn’t get very far, hitting a snow bank. Finicum, the official said, jumped out of that vehicle “brandishing a firearm.” He was shot and killed. Original post, 9:19 a.m.: A number of armed occupiers remain on the grounds of the Malheur National Wildlife Refuge in Oregon despite the arrest Tuesday night of group leader Ammon Bundy and the death of another protester, reports say. Roadblocks have been set up around the refuge and the FBI has reportedly told those who remain they are “free to leave,” though it’s not clear whether that means they won’t ultimately face any charges for their roles in the occupation. Participants in the armed takeover had been allowed to enter and exit the refuge at will until eight of them, including Bundy, were arrested Tuesday. 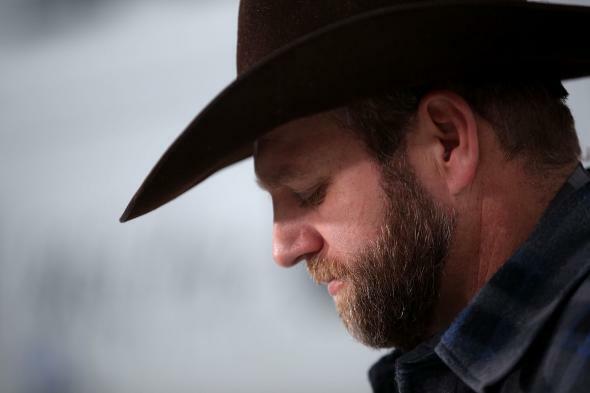 Bundy and four others were apprehended while traveling to a meeting with community leaders in the nearby town of John Day, while two more were arrested in the town of Burns and another man who had previously been at the refuge turned himself in to authorities in Arizona. A man named LaVoy Finicum was killed during the arrest of the John Day contingent; it’s not clear whether he or other occupiers fired at authorities. Only a few people had left, said Gary Hunt, who arrived Sunday from California to support the occupation. “The rest have decided they’re going to hold their ground,” he said. … Hunt said there was confusion among those remaining at the compound and he wasn’t certain who was providing leadership. In recent days, it looked as if about 40 people were staying in the buildings, including women and children. The occupation began on Jan. 2 following a nearby protest against the imprisonment of two ranchers who were convicted of committing arson on federal property. Read more of Slate’s coverage of the Oregon standoff.